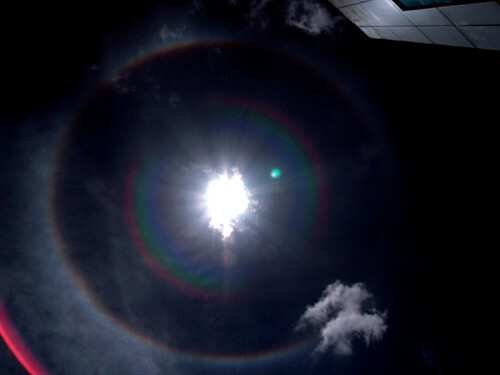 Sun halo, Kuching, 22 July 2007, 11:53am. I was outside taking in the washing from the clothes line when I happened to look up and saw this. It’s really amazing what nature can do. This is the second time I’ve seen it. The first was in 1999 (I remembered because it was my PMR year) during school. Very few noticed it though, a handful of teachers and students. I love looking at the sky, especially at night. A couple of months back I saw a ring around the moon. Beautiful.